Before becoming Catholic, I was an evangelical Protestant for about twenty years, an ordained Protestant minister for more than eleven. My conversion was hard. I broke a lot of glass coming into the Church. Because of my background and situation, becoming Catholic wasn’t something done quickly. It was the result of intensive thought and prayer over the course of some four years. It involved a rethinking of my entire worldview as a Christian — including the teaching of Scripture and the history of the Church. Given this experience, I can’t talk about Catholicism and Protestantism without instinctively making the case for the one and against the other. At the same time, I can’t talk about Protestantism without deep affection for those I still consider my brothers and sisters in Christ. Catholic philosopher Peter Kreeft has referred to the division that occurred between Catholics and Protestants at the time of the Reformation as “the most serious division” in the history of Christianity. It certainly was, and is. And the Catholic Church acknowledges that it is not without blame for the fracturing among Christianity that took place in the early 16th century. In this one and only Church of God from its very beginnings there arose certain rifts …. But in subsequent centuries much more serious dissensions appeared and large communities became separated from full communion with the Catholic Church — for which, often enough, men on both sides were to blame …. one cannot charge with the sin of the separation those who at present are born into these communities and in them are brought up in the faith of Christ, and the Catholic Church accepts them with respect and affection as brothers (CCC 816-818). I have no doubt in my mind that I was a Christian for twenty years before I ever became a Catholic — that I knew Christ. I also have no doubt in my mind that the Spirit of God was present and active in the evangelical Protestant churches I attended and served during those years. Christ uses these Churches and ecclesial communities as means of salvation, whose power derives from the fullness of grace and truth that Christ has entrusted to the Catholic Church (CCC 819). And so, with respect and affection, during this year in which the 500th anniversary of the Protestant Reformation will be commemorated by a great number of our brothers and sisters in Christ, in a series of monthly articles I’d like to ask the questions: What was the Reformation? And why did it happen? To begin, what was the Reformation? Discussing this same question, Catholic historian Hilaire Belloc in his book The Great Heresies began by emphasizing what the Reformation was not. First, he said, it was not a matter of individual Christians introducing one or two or three particular false doctrines that needed to be dealt with. It was much more general than that. I sometimes hear Catholics speak of Protestants as though they were members of a different religion: “Oh, he belongs to a different religion; he’s a Baptist.” I’ve even heard Catholics say, “Oh, she’s not a Catholic. She’s a Christian!” Allow me to attempt the impossible and put a permanent stop to this. Wrong! The division between Catholicism and Protestantism is a division within Christianity. Catholics and Protestants are both Christians. 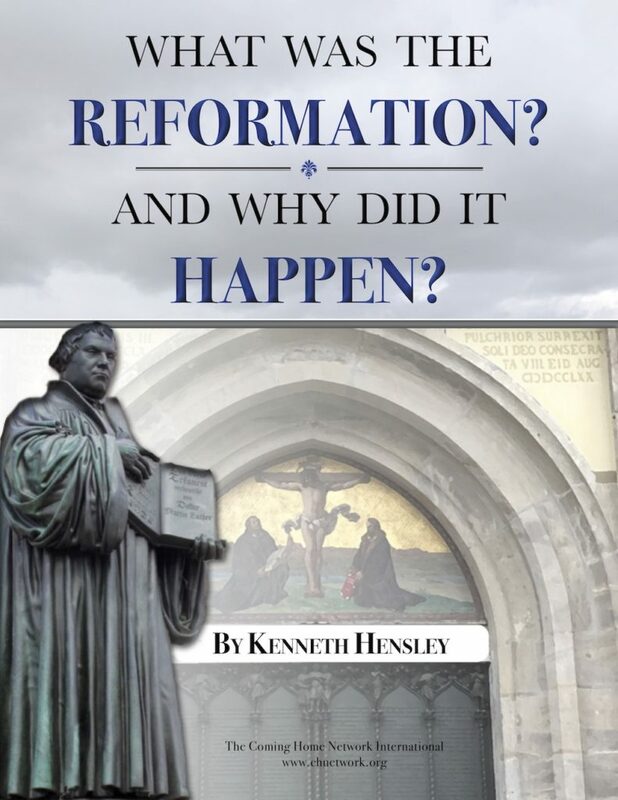 The Reformation was not the creation of a new religion. Well, if it wasn’t a matter of disagreements over a doctrine or two or even three, and it wasn’t the introduction of a new religion, what was the Reformation? What comes through is “a certain moral atmosphere” that I think could certainly be characterized as a reaction against a united spiritual authority; in particular, a reaction against the authority of the Catholic Church. We can sense this same “moral atmosphere” in the attitudes of Catholics today who oppose a number of the Church’s settled teachings — on women in the priesthood, artificial birth control, the authority of the bishop of Rome, abortion, divorce and remarriage, etc. For the most part, it’s not as though these people have rigorously studied the scriptural and theological arguments in favor of the Church’s positions on each of these issues and then answered them. Their stand is a stand against the very idea of a unified spiritual authority. Their protest embodies and conveys a certain moral atmosphere. They don’t like being told what is right and wrong. They want the freedom to decide for themselves what they think about women in the priesthood, birth control, and so forth. It was a dispute over the issue of authority that tore at the Church in the early 16th century. The separation that occurred at that time between Catholic and Protestant was a separation between those who continued to embrace the spiritual authority of the Catholic Church on matters of faith and morals and those who rejected that authority to stand, with Luther, on the authority of Scripture alone. Martin Luther began by saying, “I do not accept the authority of popes and councils; in matters of faith each Christian is his own pope and council” (D. Martin Luthers Werke, Weimar: 1898). Yet, within a very short time (two years!) he was complaining, “There are as many sects and beliefs as there are heads!” (Letter to the Christians at Antwerp, 1525). Protestantism fragmented almost immediately because of disagreements among the various Reformers and denominations created by the Reformation. But the one thing Protestants had in common was this reaction against the idea that there existed on earth a united spiritual authority outside of the Bible itself, and that the Catholic Church represented that spiritual authority. There are a great number of Protestant sects and denominations in the world today. And they differ with one another on a great number of issues, both doctrinal and moral. Another way to express this is to say that the foundation of the Protestant worldview is sola Scriptura — the belief that the Bible serves as the “sole infallible rule of faith and practice” for the individual believer, and for the Church as well. This is how evangelical Protestants think. This is how I thought for many, many years. And for the most part, it wasn’t a position I came to as a result of some serious in-depth analysis of the Protestant and Catholic “claims” with respect to the issue of authority. For the most part, it was simply assumed. Every Christian I knew thought this way, as well as every church I attended and every teacher I listened to. So how did Protestants come to think like this? What were the causes of the Reformation in the 16th century? And how is it that so many at that particular point in history came to react against the spiritual authority of the Church?